There is much that has been written, and many questions answered about what went on at AeroCamp, but nothing has really been said about how it came to be. I think that it is important story to tell given that what most people see is only two days of testing and and final results of all that testing. 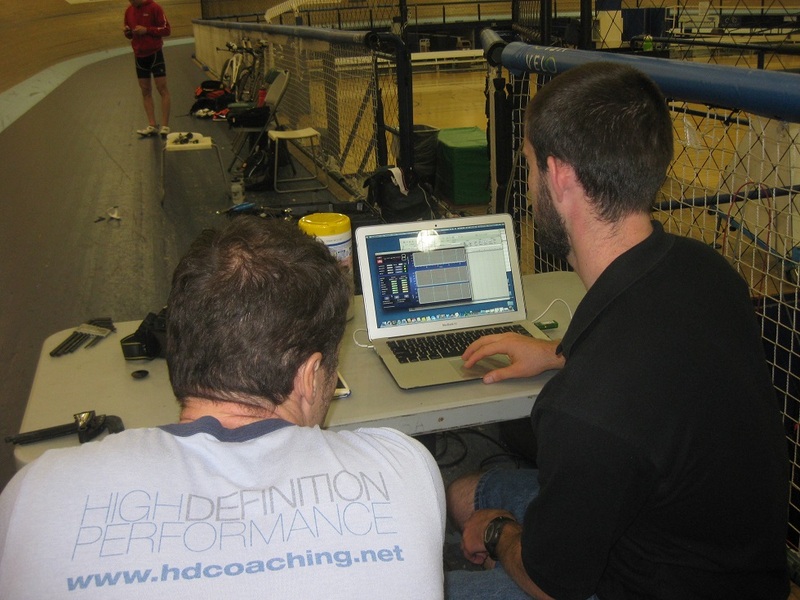 There is so much more than that, and in fact, AeroCamp was close to a year in the making. Success doesn’t happen overnight it only happens with lots of work and planning. Almost exactly one year ago, Andy Froncioni of Alphamantis (the brains and software behind the TrackAero system) reached out to me on Facebook. He simply said that he noticed some of my posts and that, in his words, “you really seem to get it and unlike a lot of people, put some real thought into your answers.” He then inquired if I would be interested in working with Alphamantis to help try to bring this technology to the market. 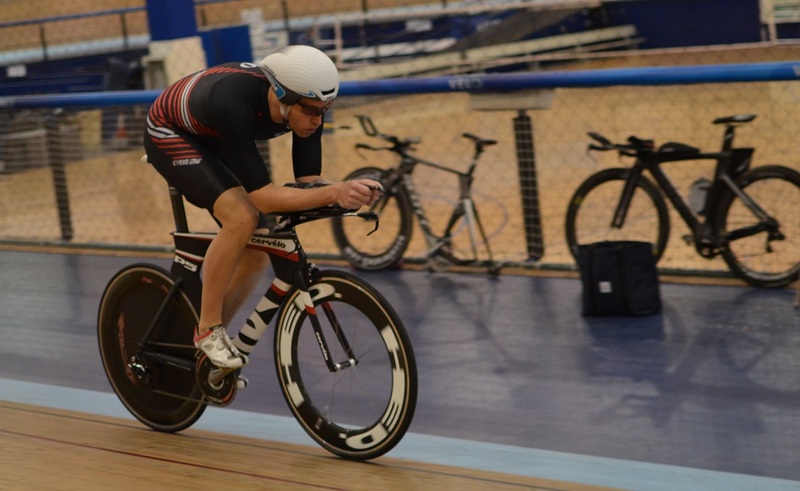 This was just after their first partner Jim Manton, of ERO-Sports had just gotten a ton of press for the aero testing at the VeloSports center in Carson, CA. Needless to say, I jumped at the opportunity. Andy and I started a regular dialogue and to be honest I’ve lost track of how many Skype calls we’ve had since the initial one. Much of our initial discussion centered on a product that’s not quite ready for prime time. I can only tell you that when it is available it will revolutionise the way people think and ride their bikes. I’ve been bugging Andy incessantly since I first got wind of this tech, an he’s graciously put up with me acting like a kid asking if Santa is here yet. We came to the realization that we both wanted to work together we just needed to find a way to put it into motion. I give Andy full credit for the initial idea of having an AeroCamp. The initial details were sketched out and then I knew that I would need a partner coach to help me pull this off. I approached fellow coach and friend Brian Stover, of Accelerate3, to pitch the idea to him. We had worked together and put together a camp in Asheville in the spring that was largely successful, save Brian breaking his collarbone on the descent off Mt. Mitchell. It was however, enough to know that we worked well together and have similar philosophies and coaching styles. I believe I brought this to him not too long after he had moved to Asheville for the summer. It was, quite frankly, the easiest sale I’ve ever made. It was definitely a “Whatdayathink? Hell Yes!” kind of situation. I introduced Brian to Andy via another Skype call and we were rolling towards camp. Starting around the middle of September things started getting quite hectic. We had multiple conference calls to discuss the details of how this would work. 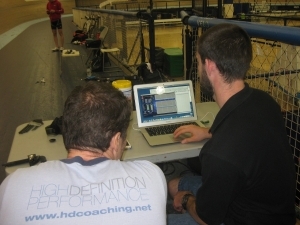 The conference calls were between Andy, Brian , Jim Manton of Ero-Sports, and Adam Duvendek who manages the velodrome. There were a significant amount of details from lodging, food and dates for track time that needed to be worked out as well as figuring out the logistics of testing 10-15 people over two days. This had never been done, as most of the testing takes place on a one-on-one basis. Plus there was a sense that we needed to give the group more than a dry test environment. 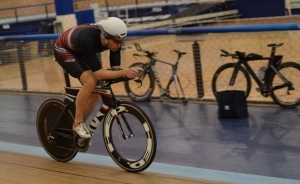 We ultimately decided to bring in the track bikes and get the group, of triathletes no less, to ride from the wall to the apron and in a paceline in order to get used to the banking. That was perhaps the best idea and most fun everyone had all weekend. That 2 hours on the track in the morning was really key in maximizing the track time since so much time is wasted in get people to actually ride around the 42+ degree banking. There was truly no rest for the weary on the weekend. 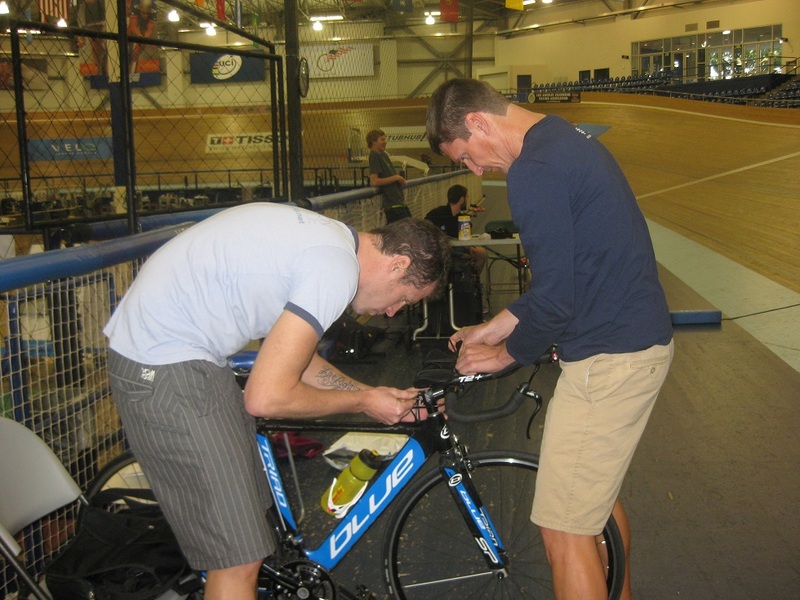 From the time we arrived on Friday, we were at the track getting people set up with Jim for bike fits and figuring out testing schedules. The next morning we were at the track at 8:00am to learn to ride the track with US National Team member Missy Erickson, who was awesome. That afternoon Brian and I sat down with people and worked out what they would test on each run. Then from about 3:00 pm until almost 11:00 pm we were at the track testing. The next day we tested from 9:00am until 6:00pm. All during this time Brian and I played mechanic and record keepers, helping people make all their changes as another person tested out on the track. It was non-stop and it was great that almost everyone pitched in to help knock out as many runs as possible. In all we successfully completed over 138 runs. Brian and I even got our own turn at the end of the last day. Thanks to a nice write up by Herbert Krabel over at Slow Twitch and a resulting forum thread with nearly 20k views, our inboxes were full and quite frankly it has only slowed down a little bit. We’ve had a couple of conference calls and so many emails back and forth with all the involved parties that I’ve officially lost count. The verdict is that it was an overwhelming success for all involved and we are now in the process of planning AeroCamp 2.0. Luckily we’ve learned a few things that can make it go just that much smoother for both the staff and participants. We feel like this is going to get to be a regular thing for us, but next time I’m just going to make an effort to actually see the Pacific Ocean. Adam Duvendek, for securing the track for us on the weekend. 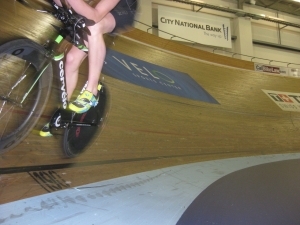 It was a huge thing for us to get the velodrome all to ourselves on Sunday for the entire day. Also the entire staff there at the velodrome is top notch. You are really missing out if you are in the area and don’t go by there. Jim Manton or ERO Sports. He was our boots on the ground guy and absolutely major part of the success of this camp. His expertise in conjunction with his contagious enthusiasm had everyone pitching in and learning more than they thought they ever would. Andy Froncioni of AlphaMantis: His passion for this technology, and the belief that it can truly change cycling as we know it, drove this thing from the beginning. He helped deliver the late product update that allowed us to test multiple riders in succession with minimal downtime. Without that key piece this would not have turned out the same. Brian Stover: Helped share the workload and push the marketing of the camp to get the numbers we had. It is always a pleasure to work with him.